I’ve had a few intense days with work, but as far as I know it all paid off this morning with the opening of our relocated library at Carindale. My entire body is still stiff and sore from the mammoth effort I put in over the past three days, but I know it will pass. Because I’ve been quieter than usual online for a few days, several people from the Fatosphere have taken the time to check in on me, just to give a wee nudge and make sure that I’m still about and ok, which was absolutely lovely. In the spirit of focusing on the positive this month (and the month is almost over, eep!) I really want to talk about where the true strength of fat acceptance is, and that’s in it’s community. 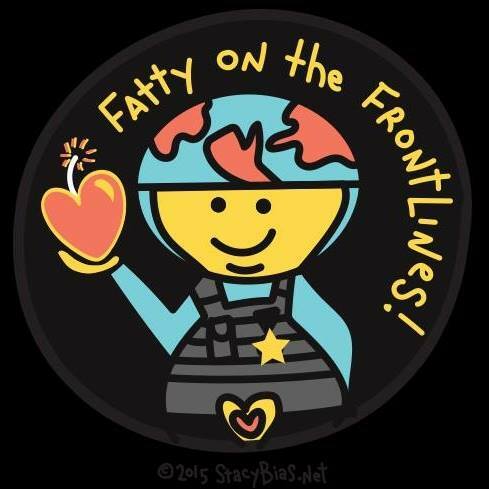 Earlier this week I was listening to the Two Whole Cakes Fatcast on radicalism and Marie Claire from Marianne and Lesley, and they were talking about the sense of community within Fat Acceptance, and how there is no rivalry amongst the fatosphere – or at least none that they feel. This is one of the things that I love about fat acceptance, the way that we see every success had by one of our peers and/or allies as a win for all of us. When one of us breaks through somewhere, is published, has a successful event, gets some good visibility happening, and so on, it benefits all of us, even those who are not activists but are just fat and want to opt out of the mainstream of diet, body loathing and shame. I was also reading this post from Lisa of Lisa’s Life Lessons on how she has received a lot of vitriol for speaking out against weight loss surgery, and how merely telling her story, and sharing the stories of others who have suffered like she has, has drawn quite a lot of hatred in her direction. She has found haven in the Fat Acceptance community as well as encouragement and support. The comments on her post are further evidence of this. It only takes an event where Fat Acceptance activists and allies get together to highlight how strong the community we have is. Marianne blogged about the Re/Dress NYC indie trunk show event and expressed how supported, encouraged and welcomed she felt in that space. I have talked about it myself after attending the Australian Fat Studies conference in Sydney. There is nothing like being in that space with people who you don’t have to explain or justify your choice to opt out of body loathing and shame. The power of community is often underestimated. Particularly by those who wish to silence and further marginalise people. Our strength is in being able to support each other to go back to what we do time and time again. I am so thankful that I came into this community thanks to Fat Acceptance activism. It’s what keeps me going and makes it worthwhile when the haters turn up. Thank you for being part of my community. I couldn’t agree more. Communities are very powerful for a common voice and struggle, be it against bigotry, self-hate, and injustice in general. Re/Dress is also a fab store! I haven’t gone to any events there yet but I went to sell/trade some clothes and everyone was incredibly nice. One day I will get to Re/Dress. One day! Heyyyyy!! Thanks for the shout out! Yeah, it IS the community where I can be free from body shame, finger wagging, tongue clicking, unwanted diet advice, food policing, etc. If it weren’t for the encouraging comments from other FA folk I’d have lost my nerve to speak a long time ago. Fat hate is very real. Regrettably it’s very real in the weight loss surgery “community” where I receive little to no compassion or respect because I dare to speak of my negative experiences….BUT many who have also had bad, nearly lethal, weight loss surgery experiences contact me for support. I have to keep speaking for those who need to hear that voice. Community is so important. I need to see, hear, read other people who have fat on their bodies. If I don’t see fat bodied people out there living life, being bold, authentic and wonderful I may not be able to keep my nerve. Thanks for all of you and all you do! Keep speaking Lisa and the voices will swell behind you. I do believe that. And thank YOU for what you do. lovely post sweetheart, I love this. Let`s all be the best friend we can be. It always gets to me how people who might have experienced hate or bullying do the same themselves. The power in choosing to support and love is so much greater.